For the first time in Mansion’s history, there are two major interior conservation projects happening concurrently. 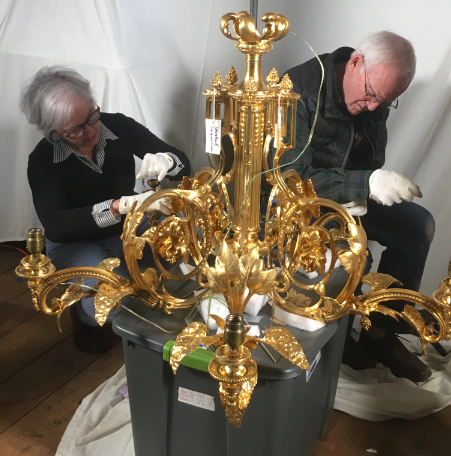 In the Reception Room, conservators have completed the conservation of the magnificent gasolier (originally a gas-powered lighting fixture), which will be reinstalled in the room in the coming weeks. Planning continues to restore the room’s original textiles, including the teal and gold curtains and passementerie (window treatments) as well as the original Axminster carpet, which will be backed and returned to its proper place in the room in the coming months. Meanwhile, work will begin in the Parlor, where we were awarded a prestigious Save America’s Treasures grant in September. Much like the process in the Reception Suite, conservators will begin by cleaning over 150 years of coal soot and accumulated grime on the room’s Second Empire-inspired painted plaster walls and ceiling. 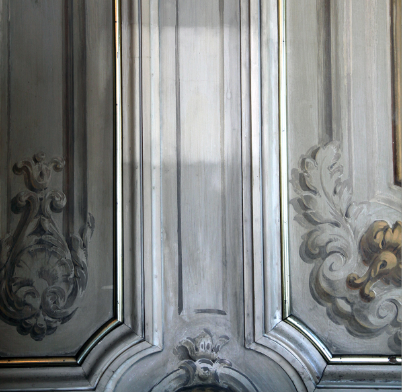 Additionally, in early February, conservator Gianfranco Pocobene will repair the flaking paint of the masterful tromp l’oeil ceiling in the Dining Room, which was last restored in the late 1980s.